This past Monday was May Day or Worker’s Day. Which, not surprisingly, in a Communist country, is a day off. What was surprising was discovering that this holiday is in commemoration of the 1886 Haymarket Massacre in Chicago, when police fired on workers who were striking for an 8-hour workday. It is celebrated in more than 80 countries, not all of them communist. We decided to take advantage of the long weekend and head to the very capitalist country of South Korea and spend four days in Seoul. 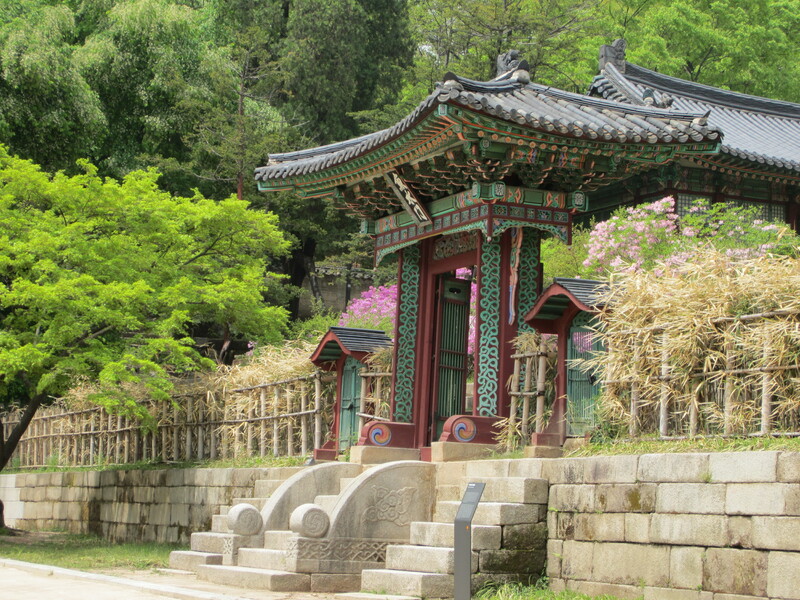 We chose Seoul as much because it is only a two-hour flight from Beijing than for any other reason. We knew almost nothing about it when we landed except that Kim chi is Korean and I adore it! And of course, I had seen every episode of M*A*S*H.
Well, we were delighted with our choice. 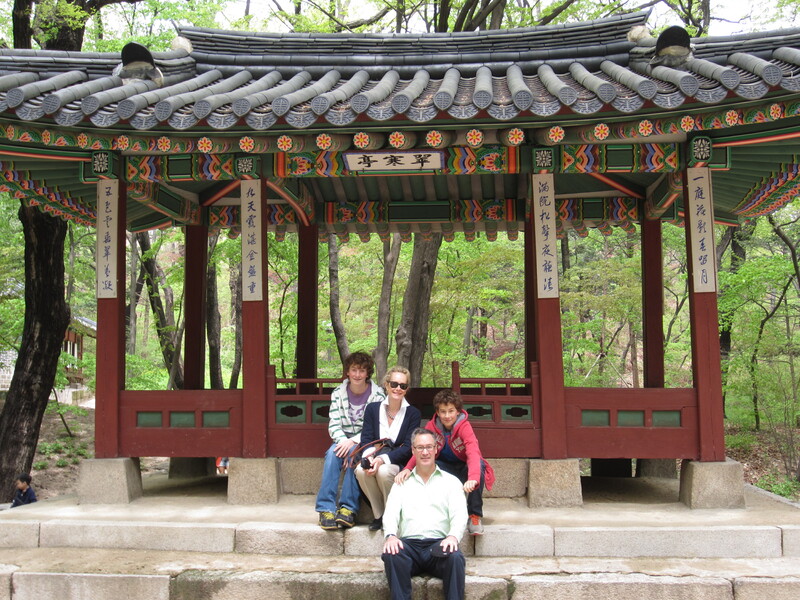 It is a fabulous city and the Korean culture so much richer than we had imagined. We spent hours in the National Museum, which had a fabulous MP3 player you could rent for about $3. It helped us catch up on the history of what was once called the Hermit Kingdom. Korea is a strategically placed peninsula which has been coveted and invaded by both China and Japan through out its past. It is now one of the world’s most successful economies with a very high standard of living. It also has it’s own alphabet quite different from Chinese and Japanese characters. We toured stunning old palaces dating back several hundred years, although heavily restored from damage due to fires and war. We have become so accustomed to western palaces, which are typically a huge single building. These are actually a series of pavilions set in the most striking gardens. When I told the boys and John that I thought we should redo our Vancouver house in this uncluttered and serene style they just groaned. Given the horrors the Korean people endured under the Japanese occupation, I hate to say how much Seoul reminded me of the wonderful calm and politeness we experienced in Tokyo. Both cities are crowded and bustling, yet you rarely hear a car honk; people wait patiently in line and you see almost no one smoking or dropping litter. It was an unexpected relief for all of us. And turned out to be a nice break from Beijing’s more aggressive atmosphere. The hotel had made a mistake in booking our tour of the Demilitarized Zone, which sadly we did not get to see, but gave us the use of a car and driver for the duration of our stay as compensation. It was a heavenly treat. Our driver’s name was Kim and he spent a good part of his day driving us from one meal to the next. There is a lot more to Korean food than Kim chi… Among our culinary adventures were Korean Barbeque, which is really marinated meat grilled at your table, a Buddhist vegetarian meal of about 75 courses and a noodle restaurant with only three things on the menu: hot noodles, cold spicy noodles and soup dumplings! It was a great weekend away and a marvelous chance to relax and reconnect as a family. Can’t wait to go back!